A graduate of the UCLA International Medicine Graduate Program, Dr. Jose Javier Hernandez examines a patient at Adventist Health in Hanford. California’s rural Kings County has far fewer doctors than the patient-to-doctor ratio that defines a federal “shortage” – 3,500-to-one. It also has a high percentage of immigrant farmworkers, many with customs and perceptions of health that most U.S.-born doctors wouldn’t understand. 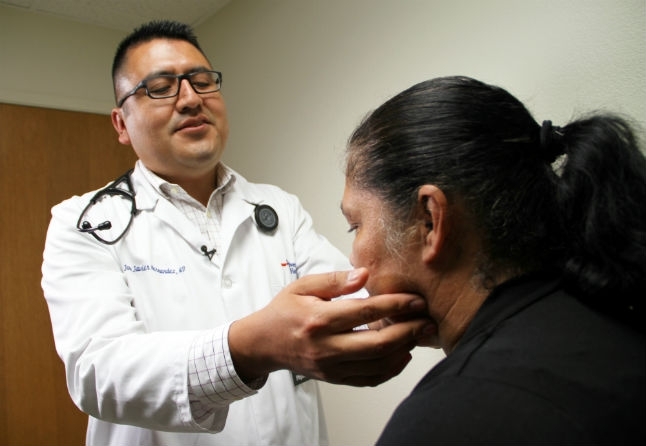 Both of these factors make Dr. Jose Javier Hernandez an important part of the solution to some of the area’s health care disparities – just as UCLA Health and the David Geffen School of Medicine at UCLA intended. A first-year resident in the family medicine residency program at Adventist Health in Hanford, Hernandez is a graduate of the UCLA International Medical Graduate Program, the only program in the U.S. sponsored by an academic medical center that benefits both immigrant physicians and the underserved community. Specifically, the program helps legal immigrants who have already graduated from a medical school outside of the United States, Puerto Rico or Canada to pass their U.S. licensing exams and obtain U.S. residency training in family medicine. In return, the participants — once they’ve become residency-trained and licensed — provide care in underserved communities for two to three years after completing their family medicine residency. 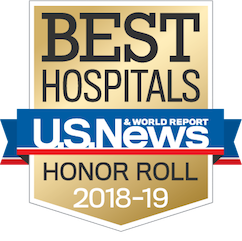 “What’s so unique about our program is that it often means immigrant patients, who are typically underserved in medicine, are cared for by doctors who are new immigrants themselves,” says Dr. Michelle Bholat, executive director and co-founder of the International Medical Graduate Program. Hernandez originally attended medical school at the Universidad Autonoma Benito Juarez de Oaxaca. When he immigrated to the U.S., he could no longer practice medicine due to the country’s licensing requirements, so he worked with an interdisciplinary rehabilitation program for injured workers with chronic pain. Later, he worked at a children's hospital, assisting asthmatic children from immigrant families to achieve better control of their symptoms. But Hernandez was trained to be a physician. That’s what he was called to do. So in 2015, Hernandez applied and was accepted to the UCLA International Medical Graduate Program. The program made all the difference, not only for Hernandez, but for the patients he now treats. His patients listen to Hernandez because he understands more than their language. He understands their customs and culture. His background helps him connect. He understands that many recent immigrants have culturally based views of diagnosis and treatment. “They have a huge attachment to traditional medicine, meaning people would rather go with natural healers or their neighbors to ask what they can do about various conditions, than to a doctor,” Hernandez says. "There are strong beliefs about someone becoming dependent or addicted to a medication within the Hispanic community; therefore, people would rather try home remedies or herbal medicine first before seeing a doctor. This can be an advantage when dealing with opioid prescriptions; however, it becomes an issue when it comes to medication compliance for chronic medical conditions such as asthma, diabetes or hypertension." Knowing their culture helps him form a bond, one that leads to a necessary component of any doctor-patient relationship – trust. As an example, Hernandez cites the case of one patient with high cholesterol that was not well-controlled. The patient said he was eating a low-carbohydrate diet with few tortillas and little fruit. But, as it turns out, the man was using lard to fry all his foods. Hernandez helped him understand the connection. That one interaction illustrates the symbiotic beauty of the International Medical Graduate program. It helps patients who desperately need it while directly addressing the issue of “brain waste,” that is, the underutilization of physicians who have immigrated here legally, but are unlicensed and working far below their education levels. In short, the program gives committed doctors a chance to do what they do best – help others. Learn more about the UCLA International Medical Graduate Program.